Website and processes: 2 Jun 16 Lawrence King, 3/5 Average "Fine , but due to an error on my account, it took longer than it should and I has to enter details twice." An aeroplane pilot trial lesson. Your 60 minute experience includes a ca. 30 minute briefing, 30 minute hands on flight and insurance. Voucher can be used at airfields nationwide. 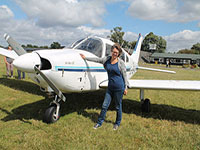 The trial lesson is preceded by a short flight briefing with our instructor who will explain all aspects of the flight including the effects of controls and how an aeroplane flies. The student will then be allowed to take the controls and actually fly the aircraft! A trial lesson will give a good insight into the thrills of flying and at the end you will receive a certificate signed by our instructor. A truly fabulous gift for anyone of any age and also a perfect introduction to flying for those who have always wanted to try flying an aeroplane. Maximum weight is 15.5 stone (98 kg); maximum height is 6' 6" (1.98 m). Minimum age is 12 years (adult supervision required on airport premises for under 16's). Voucher valid for one participant at UK wide locations. While we will try to offer your original choice, we reserve the right to alter take-off locations as required by operational circumstances. The voucher will have Gamston printed on it, but it can be used from..